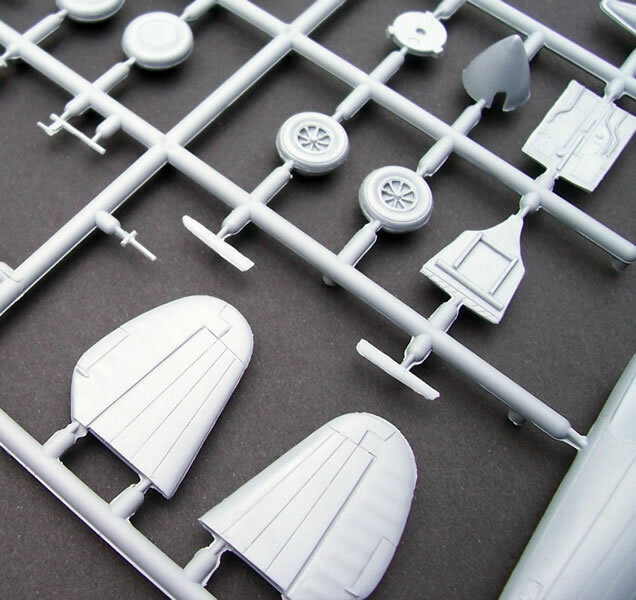 Fifty-seven grey and three clear styrene parts, one PE fret of seven parts, and decals for four subjects. Available online AZ Models for €14.00, Hannants for £14.42, and Modelimex for €12.08. 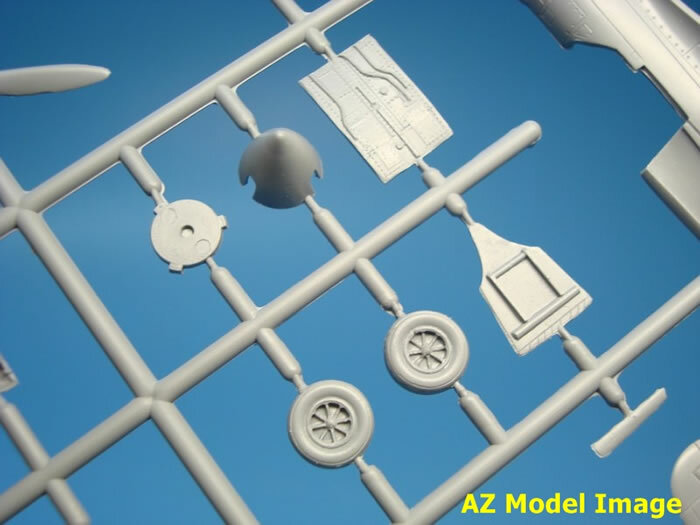 Other AZ Model stockists that may carry or offer this kit can be found here. Good interior detail, seatbelts moulded with the seat, excellent clear canopy, nice decals, optional exhausts and pitots. A lot of flash to clean up. This AZ Model kit (and its Legato equivalents) is the best-detailed P-40E out of the box in 1/72-scale, and is well priced. However, I think that the Legato boxings offer better value at 32% less cost than the AZ Model boxing. 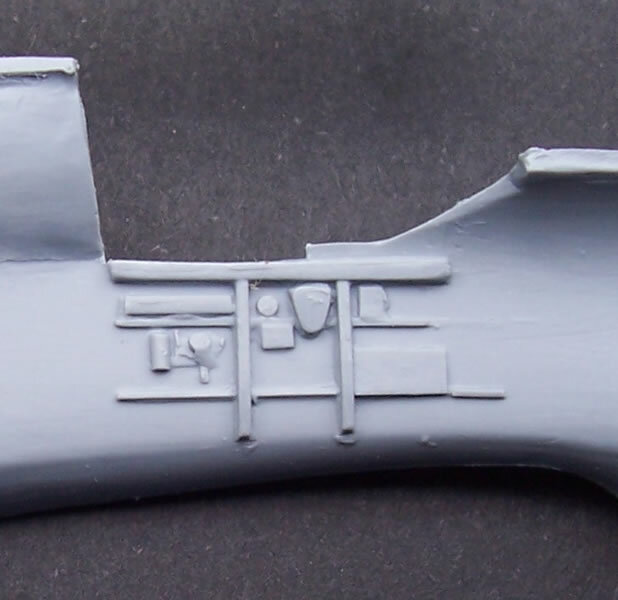 The kit equals Hasegawa’s P-40E in outline accuracy, has similar surface detail, but offers much better cockpit detail. A choice of exhaust styles and British and US pattern pitots are nice touches too. The clear parts are superb. The decals look to be excellent as well. There is a fair bit of flash to clean up due to the epoxy moulds used; but this goes with the territory when it comes to limited run kits. Overall, however, I think that the kit will build well. 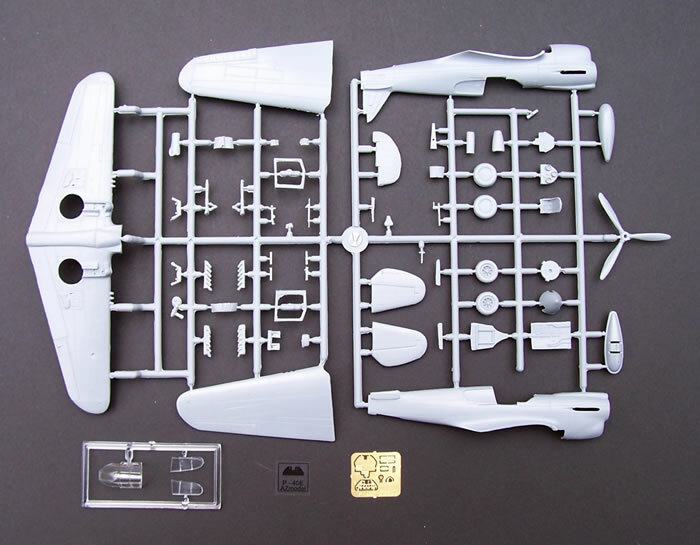 This P-40E/Kittyhawk Ia kit is a welcome release; I recommend it to those who do not mind a bit of parts clean up. 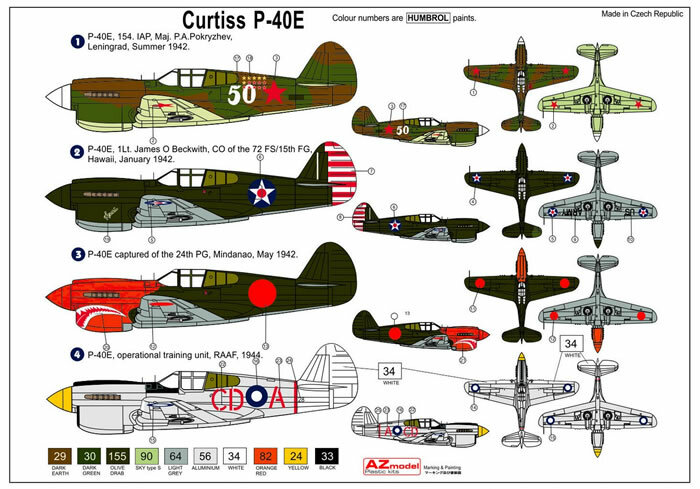 The general history of the P-40 is well known to many, so I shall not repeat it at length here. Instead, I shall cover the key features of the P-40E, which was known as the Kittyhawk Ia in British and Commonwealth service. The P-40 was of course an in-line engined derivative of the radial-engined P-36. Curtis was developing a new fighter for the USAAC known as the XP-46. This was to replace the P-40B/C or Tomahawk IIa/b in British service. The XP-46 used a new version of the P-40’s engine that offered better performance at altitude. This new version of Allison’s V-12 was known as the V-1710-39. It turned out that the performance of the XP-46 was only a marginal improvement over the P-40C. Meanwhile, Britain was desperate for fighters early in the war, and looked to purchase what it could from the USA. They had ordered a new version of the P-40 that would use the XP-46’s V-1710-39, to be known as the Kittyhawk I. The USA had also begun to re-arm, and given the XP-46’s poor showing, it made sense to keep an existing type in production rather than introduce a new one of doubtful benefit. So the XP-46 was cancelled. The new engine installation led to both significant and subtle changes from the P-40C. 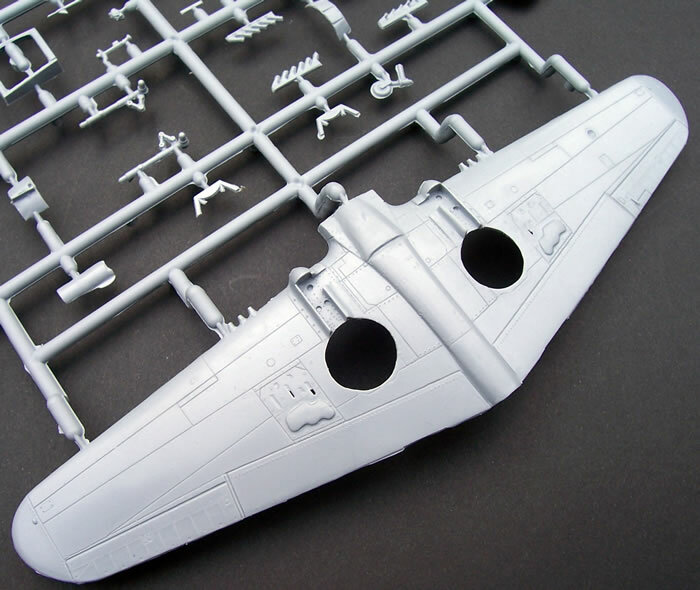 These included the removal of the nose guns, a raised thrust-line, a different radiator shape and new cockpit glazing. 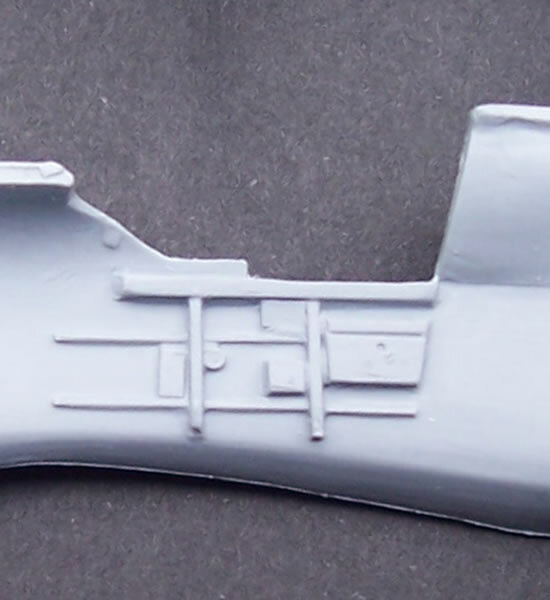 The fuselage was shortened slightly and made thinner in cross section, and pilot armour added. A shorter undercarriage was also adopted - perhaps because of the raised thrust line? The wing armament changed from four .30-cal to four .50-cal machineguns, offering a much heavier punch than before. A 500-lb bomb of 52-fgallon drop tank could also be carried. This new model was known as the P-40D to the USAAC and Kittyhawk I to the British; they received only 22 and 20 respectively before adopting a new model. This was the P-40E or Kittyhawk Ia, which had two additional .50-cal machineguns in the wings, making six in total. During its production run fishtail exhausts were introduced to replace the earlier round style, and some late P-40E had a fin fillet fitted that was like that used by short-tailed P-40K’s. The main external difference between a US and British machine was that the latter used cranked pitot like that of the earlier Tomahawk. The P-40E was widely used by numerous nations in virtually every land-base theatre of WW2. It gave sterling service despite sometimes being outperformed by its adversaries. It was rugged and heavily armed, and if when flown to exploit its strengths it could hold its own. In fact, it often held the line when there was nothing else suitable or available. 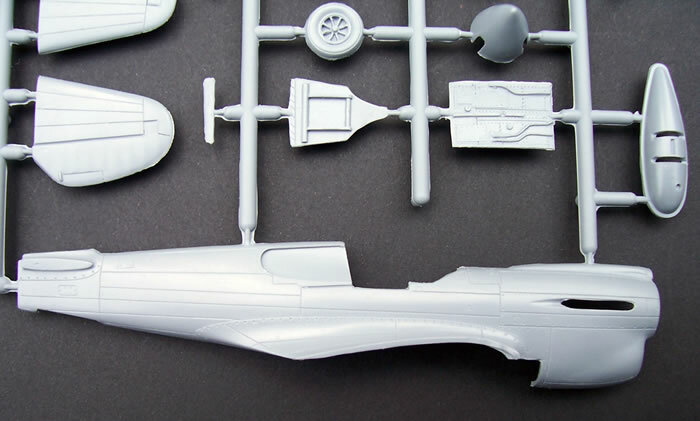 It should be no surprise, given the type’s significance, that there have been a fair few P-40E kits in 1/72-scale. These include Airfix/MPC, Revell, Frog/Airlines and Heller as 1960’s classics; with Century, Alpha (a vac-form), Cruver, Nichimo, and Polistil as rather obscure brands that are most likely old-style kits too. 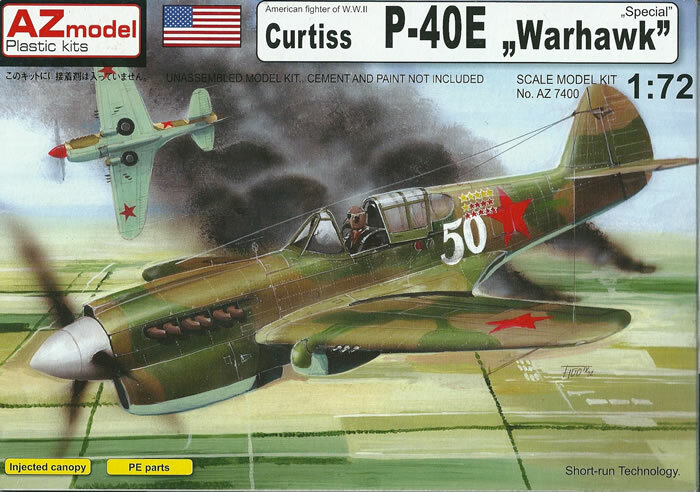 The Hasegawa/Minicraft kit has been around for quite some time now, but along with Hobby Boss represents one of only two modern-style P-40E contenders of which I am aware. Both have engraved panel lines, but are probably around 30 years apart. The Hasegawa kit is simple with good lines, nice surface detail and very basic cockpit detail. 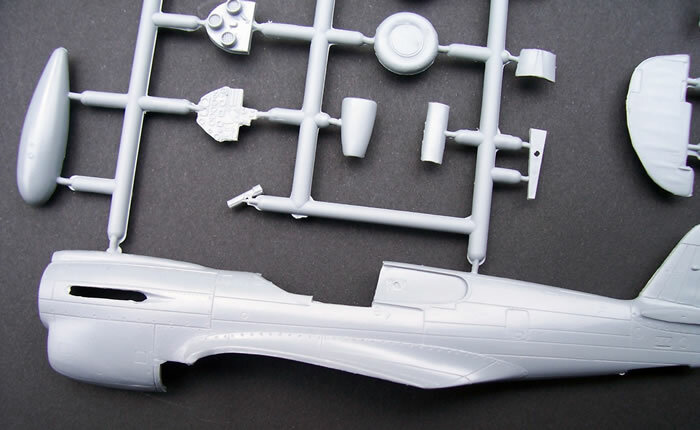 Hobby Boss is a simplified assembly kit with the expected concessions to this approach such as undercarriage doors moulded with the legs. Clearly then, there was an opportunity in the market for a modern and more highly detailed P-40E kit. The kit comes in an end-opening box with attractive enough artwork on the front. To AZ Model’s credit, they advise in small print on the front of the box that the kit is “Short-run Technology”. 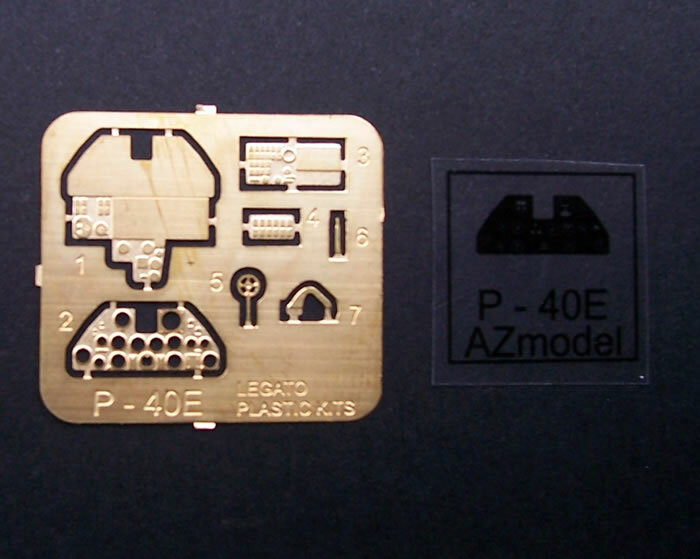 The instructions have a parts map and use easy to follow assembly diagrams. These are adequate, and have colour call-outs cross-referenced to the Humbrol paint range. The last page of the instructions has some basic plans of the P-40E. There is also a brief history of the aircraft, although the text of this has been justified and is quite awkward to read because of the irregular spacing between letters – not that this maters much. All text is in English. The painting and decal guide is in colour on the reverse side of the box using profiles and small upper and lower plan views. A resealable cellophane bag encloses the parts and decals, whilst the clear parts and PE fret come in small bags of their own. 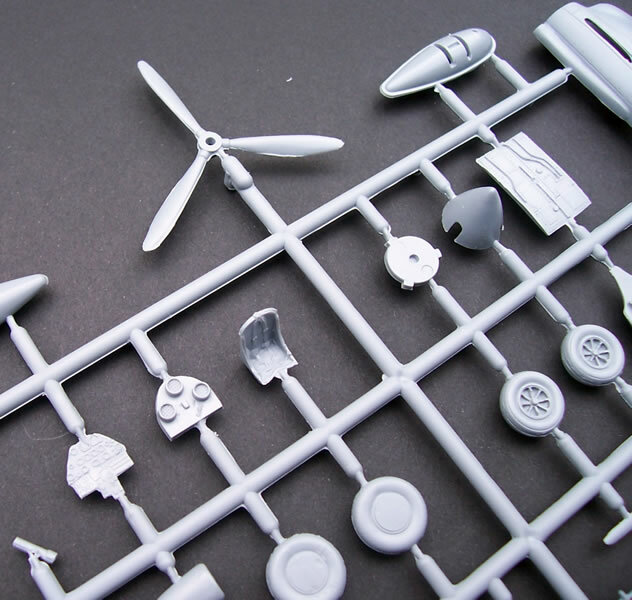 The kit is a limited-run moulding with a fair degree of flash in places, although the sprue gates are thankfully narrow. Panel line detail is quite acceptable, with fastener lines around the wing roots. The parts break down is conventional for the type. 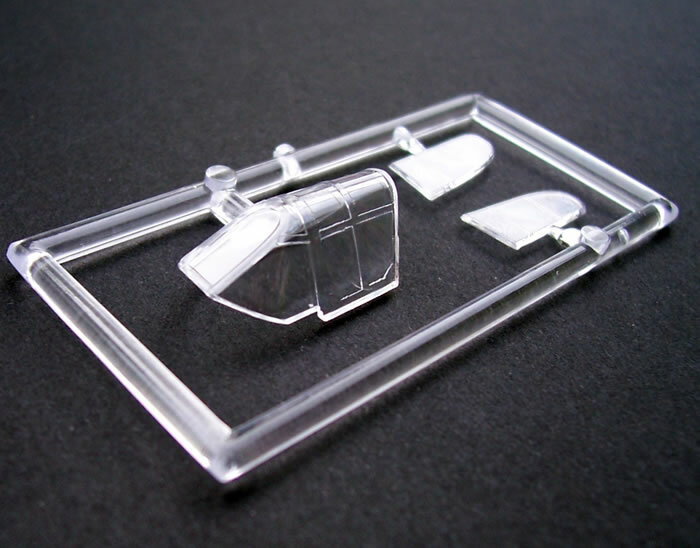 The clear parts are superbly clear, especially so for a limited run kit. The mall PE fret looks fine. Cockpit detail is good for the scale, and a lot better than other P-40E kits. There is a floor, rear bulkhead, seat with harness moulded in place, the prominent hydraulic pump lever, rudder pedals, control column, gun-sight, and sidewall detail moulded with the fuselage halves. There is a choice of plastic or PE instrument panel with instrument film. I liked the fact that the floor correctly simulates the curved upper surface of the wing. The radiator and oil cooler are fine with the ducting moulded separately. There is only one choice of radiator gills provided, these being almost shut. Both early and later style exhaust are provided, but they will demand a lot of cleaning up due to flash. 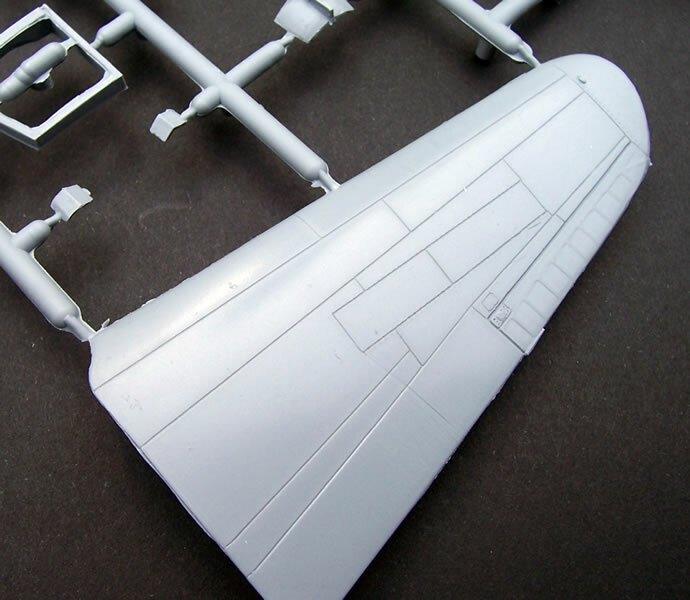 The exhausts fit from the inside of the fuselage, which means they cannot be left off until painting is completed. The prop blades and spinner are similar in finesse to those found in the better mainstream P-40 kits. This covers all the items enclosed by the fuselage halves except for the small interior floor of the tail wheel well. I thought at first that the bulges in the underwing gun access hatches were over-pronounced, but having checked photos, I think they are okay. I you disagree then all that is needed is some light sanding. The protruding gun barrels are moulded with the wing halves, rather as separate blocks that insert into the wing leading edge. This will make for more work cleaning up, but should be okay. The detail in the wheel wells is acceptable and their door thickness is within the reasonable limits of what is possible with injection moulding. The undercarriage legs are fine, but the wheels come in two halves because of the limited run moulds. Not a lot remains to mention; there is the centre-line drop tank with its sway braces, a choice of US or British style pitot, and a very nice canopy. There are also a PE rudder actuator link and a ring & bead gun-sight. I think this should be a simple and enjoyable kit to build once the flash is cleaned up. Rather than rely on plans which can be of questionable accuracy, I elected to compare shapes to my example of Hasegawa’s P-40E; a kit that I could find no criticism of shape or dimension-wise. 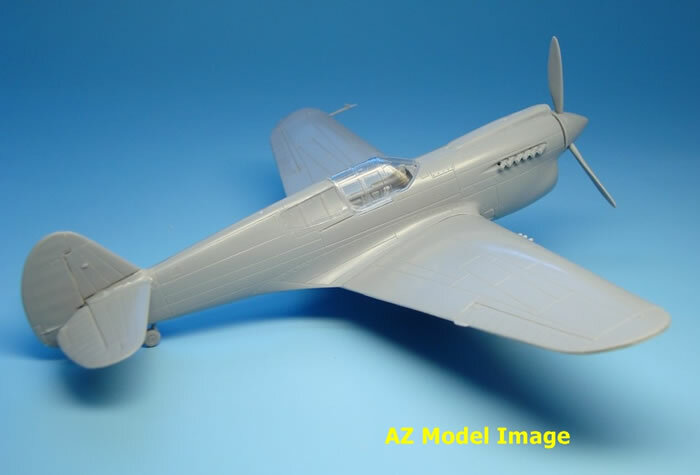 I found that AZ Model’s parts conformed exactly to Hasegawa’s for all intents and purposes, suggesting that there is little if anything wrong with the new kit’s outlines – I leave it to the true P-40 experts to give us a more definitive assessment. There are at four other boxings of the same kit under the Legato brand listed on AZ Model’s website for €9.30 each. I think that they cost less than the AZ Model boxing reviewed here because they lack the PE fret and have only two decal options. If I am correct then I feel that they offer better value, as the PE fret and two more decal choices is not worth an extra €4.70 in my view. AZL7225 Curtis Kittyhawk Ia Aces (2 x RAF). 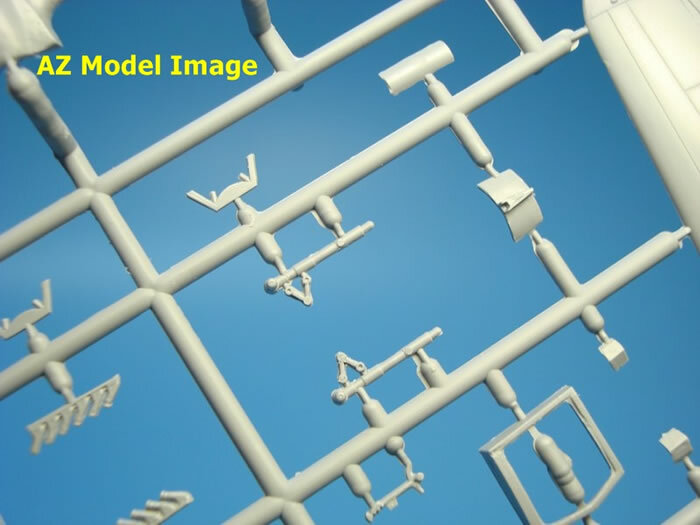 I have included images of the assembled Legato version from AZ Model’s website as well as a few sprue shots (these are the images with blue backgrounds). 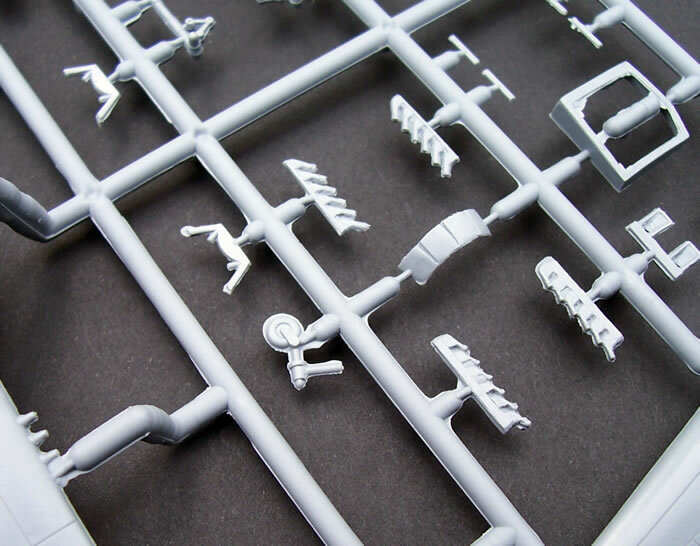 I could not but help note how much less flash was apparent on the website’s sprue shots when compared to my sample. I think that my sample must have been made later in the production run when the epoxy tool was beginning to get tired. As mentioned already, this AZ boxing features twice as many decal options compared to the Legato boxings. 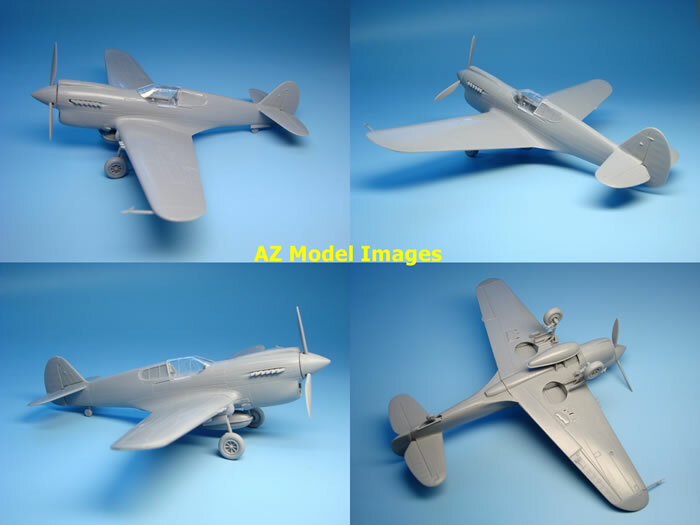 I think that AZ Model have done a good job with their selection, bearing in mind that the Legato boxings cover the “mandatory” RAF desert and USAAC Pacific options. Perhaps the inclusion of a Japanese option is unusual, but I think is one of ten captured machines put into service by the IJAAF, and it is certainly an eye-catching scheme. On the plus side, this AZ Model kit (and its Legato equivalents) is the best-detailed P-40E out of the box in 1/72-scale, and is well priced. 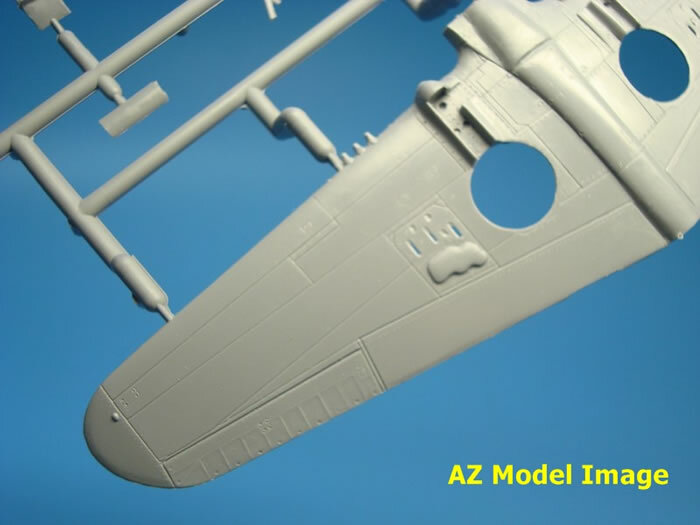 The AZ Model boxing has modest additional benefits of a PE ring & bead gun-sight, PE instrument panel and more decal options. I have never been able to make sense of AZ Model’s brand stable, and although not reviewed here, I think that the Legato boxings offer better value at 32% less cost than the AZ Model boxing. 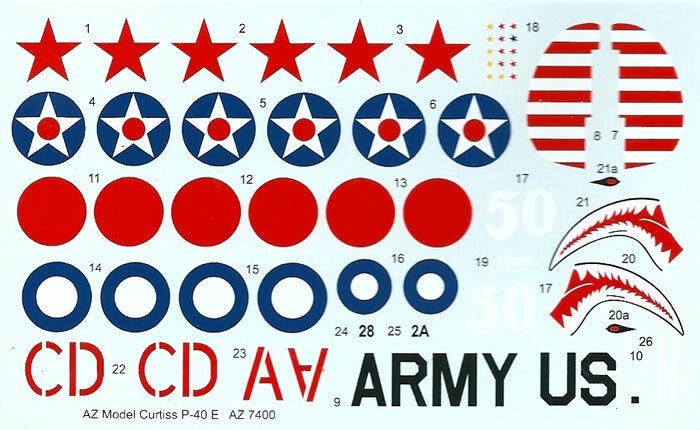 This is especially so if you do not plan to use the kit’s decals. The kit equals Hasegawa’s P-40E in outline accuracy, has similar surface detail, but offers much better cockpit detail. A choice of exhaust styles and British and US pattern pitots are nice touches too. The clear parts are superb, and match the some of the best long-run kits. The decals look to be excellent as well, so is there a catch? 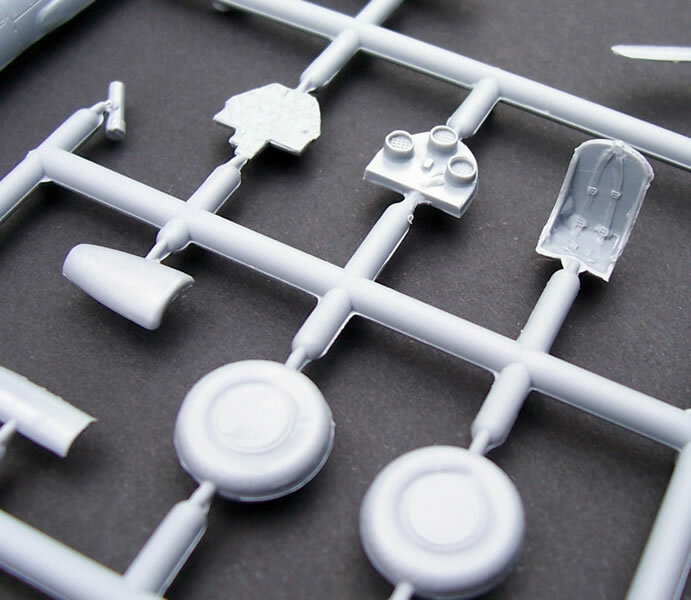 Well yes; there is a fair bit of flash to clean up due to the epoxy moulds used to produce the kit; but this goes with the territory when it comes to limited run kits. It looks worse on may sample than fresher mouldings, but either way the work needed is about the same. Overall, however, I think that the kit will build well. 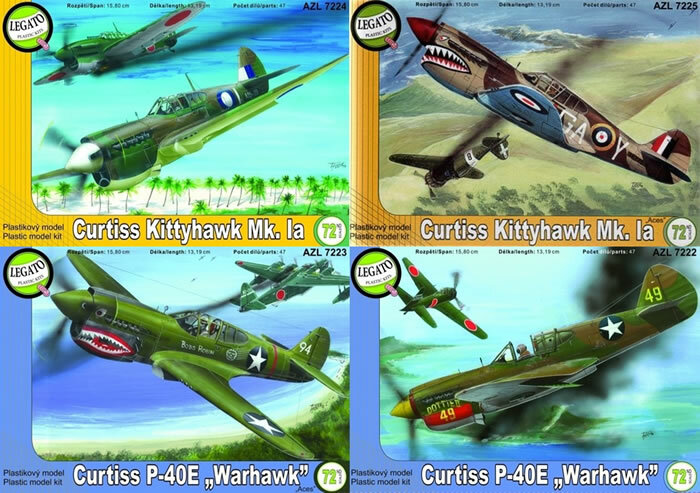 These AZ Model and Legato P-40E/Kittyhawk Ia kits are welcome releases; I recommend them to those who do not mind a bit of parts clean up. Thanks to AZ Model for these review samples.